Child with Sensory Processing Disorder Helped by Chiropractic Dopps Chiropractic: Our family bringing health to your family for over 40 years! Luke’s mother stared at the text message photo, shocked. Her 4 year-old son was swinging and actually enjoying it. “I have to forward this to our chiropractor,” she thought. 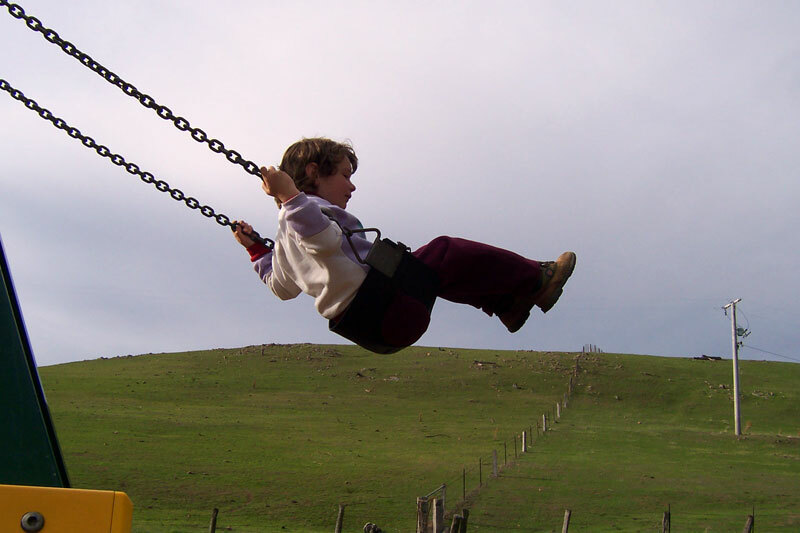 Luke had always refused swings or trampolines with others, saying “It hurts my body.” Now, after a few adjustments, he was swinging. Many times Luke’s mother had thought, “A normal, healthy child shouldn’t be acting this way. There’s something wrong with my son.” Luke’s meltdowns were legendary, and often without an apparent cause. As a baby, he had resisted being held to go to sleep or even to nurse. As a toddler, he would scream for an hour in the car, and was notoriously carsick, vomiting even on straight roads. Luke’s reactions often seemed out of proportion. Loud noises scared him. He said bright lights hurt. He would randomly say he was scared when asked to perform simple tasks. His parents spent hours trying. Trying to understand, trying not to give in to his whims, trying to train his behavior. Yet even family members blamed them for not controlling their son. One doctor said it was because Luke was bi-lingual and was frustrated while trying to express himself. Another said he was just a boy and would grow out of it. Luke was 4-years-old when an occupational therapist suggested he could have Sensory Processing Disorder (SPD). The disorder is a result of the brain’s inefficient assimilation of information from touch, vision, sound, smell, taste, movement and balance, and body position and muscle control. An estimated one in 20 children have an inability to process information received through their senses, affecting how they function in daily life. Yet many children with SPD are misdiagnosed or misunderstood and labeled as difficult, undisciplined, strong-willed, inattentive, uncoordinated or clumsy. Children with SPD either avoid or crave sensations. Loud noises or touch may trigger an aggressive fight-or-flight reaction. They may be picky eaters with a bland diet, or craving the spiciest foods. They are children excessively irritated by socks or tags, or may smell and hear annoying things others don’t notice. They can exhibit hysteria over washing hair or putting on clothes. SPD may be difficult to distinguish from ADHD, Obsessive-Compulsive Disorder, Bipolar Disorder, and can coexist with genetic syndromes, like Downs, allergies, the full spectrum of autism, dyslexia and learning disabilities. For Luke’s parents, it was like the pieces of the puzzle came together with SPD. They were patients of Dr. Ryan Dopps DC in Wichita; “Luke, hop up here and you can get adjusted too,” he said after an appointment. “He doesn’t really like touch…” his mother began to say, but Luke willingly laid down on the table. He had never looked so soothed or relaxed as while being adjusted. After that, Luke would be adjusted whenever his mom happened to bring him along to her appointment. After reading in Carol Stock Kranowitz’ book “The Out-of-Sync Child,” that SPD is a physical problem, not a psychological problem, Luke’s mother decided to see if regular chiropractic would help. It made sense as SPD begins in the central nervous system, with the brain struggling to efficiently organize sensory messages. In August 2014, Luke began getting adjusted every two weeks. It was after just four adjustments that Luke began swinging, as if his discomfort and fear had disappeared. Dr. Dopps explained that the Atlas surrounds the brain stem and 77 trillion nerve fibers carrying neurological messages to the body. When it is misaligned by even a millimeter, it puts pressure on the brain stem, inhibiting the flow of information. The brain then processes and interprets inefficiently. Adjusting the Atlas opened the pathways for Luke’s brain to receive accurate information on his surroundings from receptors all over his body. Two studies were published on chiropractic care for SPD and Autism in the 2011 edition of the “Journal of Pediatric, Maternal & Family Health.” The children showed upper cervical misalignments and signs of neurological imbalance. After specific chiropractic adjustments over a period of weeks, along with an anti-inflammatory nutritional program, they saw startling improvements. Chiropractic care, along with reducing sensory triggers and working with occupational therapy techniques, seem to provide a holistic approach, bring SPD children to a place of learning and focus.